Whole Hearts from Quaker look like little hearts and taste almost exactly like America's favorite little O's, Cheerios from General Mills. Its nutritional profile is very similar to Cheerios with one notable exception... Whole Hearts has more sugar. A one-cup serving of Cheerios has 1 single gram of sugar. A 3/4-cup serving of Whole Hearts has 6 grams of sugar. That's not bad compared to the entire world of breakfast cereals, but when pitted against the classic, we have to throw a point at Cheerios. The increase in sugar doesn't impact the flavor enough to make this new cereal better or different in any way. At the time I purchased Whole Hearts, it was about 50 cents cheaper than Cheerios. For that, we throw a point at Whole Hearts. If it stays cheaper, only the future knows. The big thing here is the shape. It's fun to wake up to a bowl of little hearts. I could see this cereal making a play in the baby finger food racket. I'm rating this cereal fairly high because I'm comparing it to all cereals. It's a simple, decent-tasting cereal with a good supply of whole grains. But in a head-to-head match-up with its most obvious competitor, we have to give the game to Cheerios. Nutritional Considerations: Each 3/4 cup serving of Whole Hearts has 110 calories, 1.5 grams total fat (0 saturated and 0 trans), 23 grams total carbs, 3 grams dietary fiber, 6 grams sugar and 2 grams protein. What do you think of Whole Hearts? I love Quaker Whole Hearts cereal! Quaker, please, please, please, please please bring it back! I ate Cheerios every day for decades, but there was always something missing so I kept trying other cereals until I happened to come across the Whole Hearts. I totally quit the Cheerios and ONLY ate my Whole Hearts. When I couldn't find it at my local stores, I ordered from Amazon until the only ones left were like $8.00 to $15.00 per box, which is insanely high. 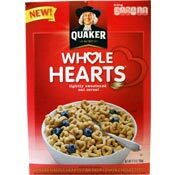 I hope everyone contacts Quaker, like I did, and tell them to bring Whole Hearts back ASAP! Love the cereal, bring it back Quaker! Love it, Love it! Now I can't find it anywhere. Please, bring back Whole Hearts. It is my all time favorite cereal. This is the best cereal ever - not real high in sugar which is good for someone on the verge of sugar problems. Sure is hard to find. Hope they aren't discontinuing. I was introduced to Quaker Whole Hearts by way of a grocery coupon. I bought a box and found it to be delicious. I bought a second box next shopping trip, and then they disappeared! I keep looking for it but so far I've seen it nowhere!! Wish I could find it again. This is my favorite cereal! To me, it is better than Cheerios in both taste and texture. When I could no longer find it at my local stores, I started ordering it from Amazon - 7 boxes at a time. Now they no longer have it either and I have one and a half boxes left. I have already started to look for another source to buy this cereal online. Has Quaker quit making my favorite Whole Heart cereal? 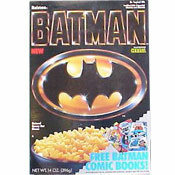 Please bring it back... Great cereal!!! I'm from Long Island and I also love Whole Hearts Cereal. I would buy 10 boxes at a time and now I can't find any. Please bring it back! I love Whole Hearts too and couldn't find any last time I checked in five stores. Are they taking something else away from me now that I like it? Why can't I find it in Oklahoma City. I loved the cereal. But, I can no longer find it. I just bought the last 3 boxes at my local store. I am so unhappy. I'm a diabetic and this cereal was perfect for me. I too ate almost a box a week. I have cereal a lot of times for dinner because I'm in a hurry or just want my hearts. Also, my grandaughter became a big fan too. Quaker, please bring our cereal back! Great cereal. I have been eating it every day since I had a major heart incident but I can no longer find it. What's up Quaker? This is the only cereal I really like and that does not make me feel sick. It makes me mad that it has been discontinued. We have been unable to find this cereal in our area. All of a sudden, it was off the shelves. Where can we find it? This is my husband's favorite cereal. Thanks! Why has Whole Hearts been discontinued? It's my favorite cereal, beating out Raisin Bran for 30 years! Also used it as treats in my classes where I introduced it to my students. It quickly became their favorite! I love the taste and nutritional content, and the price is a welcome bonus. I am very disappointed that this product has been discontinued. I am the cook in a Pre-school that takes part in the Child and Adult Care Food Program funded by the USDA. This cereal is a favorite with the kids because of it's heart shapes and the flavor. I like it because it has only 6 grams of sugar and the price is reasonable. I love this cereal and eat a box a week. It has a wonderful flavor and the heart shape is so clever! The only problem is that I can't find it in our stores any longer. Help! What is going on? This "Hearts" cereal is my favorite. For about a month I been trying to buy this cereal but was not in stock. I just found out the Quaker discontinued this product. Why discontinued? My favorite cereal. Slightly sweeter than Cheerios but less sweet than Honey Nut Cheerios (perfect balance) and the heart is better than Cheerios which adds more delicious crunch. I eat a box a week - seriously. I got tired of my previous cereal and decided it was time to try a new one. I am so glad that I chose this one. I absolutely love it and am glad I picked this one out of all the choices in the cereal aisle (box/hearts got my attention, plus it was on sale). Good job Quaker! I LOVE this cereal. I hope it never goes away. I just love this bite sized cereal. It's the perfect amount of sweetness along with its low fat content. I don't feel deprived when I'm trying to eat healthy because I can have two servings and not feel guilty. They seem to be experimenting with the formula, or have bad QC - different batches seem to taste different. Some have much more "maple" flavor than others - I tend to prefer the "less intense" versions that seem more like "honey" than "maple". Loved that it was a shade sweeter than Cheerios. This is by far my favorite breakfast cereal now. Love the little heart shapes too. I noticed that it tasted a lot like their cereal that comes in square form. Was very good and my 8 year old picky eater really likes them so I have to score them high.